Can Speedway Afford to Continue? The sudden closure of Oxford stunned everyone when the news broke on Wednesday. Needless to say, we hope that the Cheetahs will be back on track just as soon as is possible. Like so many track closures the root cause is the differential between income and expenditure. This article, written by someone who prefers to remain anonymous, looks at the Oxford situation and the current prospects for the sport as a whole. Alex Raby meets up with the Eastbourne Eagles legend to find out about his early days on the training track and the current state of youth development. Jim Henry has come up with a follow-up to our recent 'AA to ZZ of Speedway' challenge. He wonders how many riders can be found whose surname is also an occupation? The examples he gives are Bob Fletcher (arrow maker) and Johnnie Carpenter (someone who paints cars). Send your entries to jobs@speedwayplus.com and we'll feature your lists on the site next week. Mike recalls his favourite King's Lynn Stars from the seventies and eighties. He includes David Gagen alongside some far bigger names from the sport's history. 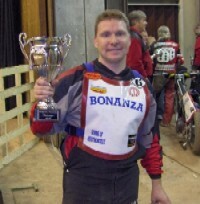 Episode 3 of the excellent "One Flew Over the Safety Fence" is now available on ITunes and at speedwaypodcast.co.uk. In this latest podcast the guys look back at last Saturday's Grand Prix and discuss whether time is running out for Scott Nicholls in the competition. They also take a look at	the Conference League and the part it plays in British Speedway. You can find out more about the podcast in this short article we added to the site a few weeks ago.
" In the Hammers '65 article you referred to Dad's name being 'Robert', his full name was John Robert Vickers McKinlay. Robert was in fact his younger brother. sorry to be pedantic!" "I found this site very interesting and very useful. Good articles and pictures." "With regard to Air-fences, I agree they should be mandatory in Premier League but also in Conference League, which seems to be forgotten in some of these debates. I'm sure all riders would trade a few meetings wages for peace of mind in contributing to the cost of installing them, just as they did in the Elite League. Conference League riders may have to forego a few more meetings wages than those in Premier League but surely it is the lesser of two evils? However, not all accidents are preventable of course. We have seen a lot of serious incidents this season but according to reports, it seems an air-fence would not have helped the unfortunate Garry Stead as he was run over by another rider. Stuart Robson though, would probably be hobbling around by now had he had an air cushion to break his fall. I believe every rider should now put pressure on the authorities to make air-fences standard in all leagues as of 2008, if not before. " "The Shay was awesome, I only saw two matches there, but they were good ones. Halifax v Belle Vue and GB v Denmark. A track sorely missed." Steven Quarterman contributes his first article to the site and tackles a subject that he feels strongly about. He believes that the time has come to address the inequalities that exist in the provision of air-fencing. Isn't it time that the Premier League boys were afforded the same level of safety as their Elite League counterparts? 'Friends of Speedway' is an international supporters club that provides a voice to the silent majority on the terraces. They also produce a quarterly magazine that's available exclusively to their members. This article outlines their aims and accomplishments, along with details of how you can join. Steve's family have been Wimbledon fans since the sport was first staged there in 1928. His selection is largely populated by Dons favourites from the sixties, the era in which he most enjoyed watching the sport. We've been contacted by people looking for video footage of Sverre Harrfeldt and Ellesmere Port Gunners - Can You Help? "Might I add that the proposed Road Charging is an equal threat to speedway. I will certainly be deterred from my 68 mile round trip to Reading each week if I have to pay £1.30 a mile for the privilege of driving on the M4. Many fans travel long distances and, given start times, avoiding the rush hour is not an option. Does the BSPA plan to raise this issue?" "I think the Sky coverage is a bit of an easy target actually. Whilst Millard in particular is a total shambles the rest of the team put on a good show in my opinion. I agree there is a tendency to state the obvious and to look at on track action through rose tinted specs, but I would have liked Jeff to have given some constructive ideas to improve matters rather than just taking cheap shots. Ironic he should choose the Wolves/Belle Vue fixture to disparage, because whilst the result was never in doubt the quality of the racing made it arguably the best action we have seen on the box so far this season. " "Brings back fond memories of a great racing track." "It's fantastic to see the Odsal bowl how I remember it. Been a dukes fan since "94", my other half used to watch them at the Shay then followed them to Odsal. When Bradford closed we were robbed of everything, our love, team, passion & the electricity that filled the air, not forgetting the chance we could of had to defend the Elite League title. We definately went out at the top. Let's hope that we do come back stronger & more passionate than before, as Halifax Dukes, once again! Hope to see you all there! " "Great place and some great racing. Swindon always had a bit of a hoodoo over the Lions in the early '80's but nevertheless some great riders have graced the place. Wilson, Titman, Jessup, Collins (x2 - nearly 3!! - allegedly), to name but a few. Shame a certain Coventry boss (allegedly) had his hand in (allegedly) closing it down. Another huge loss." We've got two pieces of writing from David Walsh this week, who says that students have too much time on their hands? Regular visitors will know that David is presently studying American and Canadian Studies at the University of Birmingham. If you're not familiar with his racing career then check out our interview with him. In this first article he appeals to MP Graham Stringer to reconsider the proposals in his private members bill on off-road motorcycles. 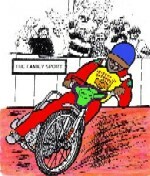 David makes several good points and recalls an incident from his own life that highlights the lack of menace a speedway bike actually poses the general public. This is the second poem by David Walsh that we've published on the site. The references to speedway are perhaps less obvious than in his previous piece, though the themes are unmistakeable. David is concerned that we may be pushing the tolerances of the 'Speedway Plus' concept by including work such as this. Our view is that, so long as there's the slightest relevance to speedway, we're more than happy to feature any kind of writing. Your thoughts on this, or anything else for that matter, are welcome. Duncan was a Leicester Lions fan and continued to follow the sport until the dreaded double points were introduced a few years back. He's selected "World Cup Willie" and "DeeJay" amongst his seven. Was Saturday evening the point at which the Conference League finally came of age? The league is now in its 14th season, under one name or another, but Chris Harris is the first of its products to graduate into a full-time Grand Prix rider. After Bomber's sensational display in Wroclaw, can we now say that the Conference League project has been a success? Congratulations to all of those who've given up countless hours of their time to help riders like Chris take their first steps in the sport. It's moments like the fourth lap of Saturday's semi-final that must make it all worthwhile! Steve Wilkes is trying to locate results for several open and challenge meetings that were never published in Speedway Star - Can You Help? "Such a shame. This is by far the better place than the Berwick FC ground. With a bit of imagination for better access, Berrington could still be the permanent home for Berwick. Having been to both places this I feel could still have the potential to be a success." "The 'Father Knows Best' Reunion In the late 1940s and 1950s, Billy Gray was one of the top juvenile stars of American films and television, and is best remembered today for his role in the science fiction classic 'The Day the Earth Stood Still', and for playing Bud Anderson on the situation comedy 'Father Knows Best' on tv. After his acting career, he took up speedway and had a successful career on the California shale in the 1970s and 1980s. In 1977, a reunion television film of 'Father Knows Best' was made, bringing the entire cast together again. In the story, the character Bud Anderson, like his real-life counterpart Billy Gray, had become a speedway rider, and a good bit of film of Gray in action at Costa Mesa speedway was shown." "Great photos, When were they taken and does the stadium still exist?" The stadium very much still exists and is used regularly for Greyhound racing. "Great site... but has anyone got the old Crayford Stadium on camera?" Good question! If anyone can supply pictures of Crayford, or other former venues, then drop us an email. "One Flew Over the Safety Fence" is the name of a brand new speedway podcast that hit the internet last week. It's a most entertaining show and well worth thirty minutes of anyone's time. We tracked down the show's presenter, Russ Duke, to find out what it's all about and what prospective listeners can expect to hear. Has it really been ten years since the last meeting at Odsal? These pictures were taken by Graham Porter in the days when speedway still had a home in West Yorkshire. Norman finds a place for this 'gentleman' in his side. This was written a while ago, we've a perpetual backlog of these, so his appeal for Lee Complin to make a comeback has already been granted! The Canadian Speedway Racing Association had a booth at the recent 2007 Toronto Spring Motorcycle Show. The booth included the impressive bike of star rider John Kehoe. John also allowed Emily Hensby to look the part in wearing his leathers! The show is the official kick-off to the motorcycle season in Canada. The event was the best attended in the past 31 years, and generated good coverage for the season which begins on May 26th in Barrie, Ontario. Andy Waddington is looking for video footage of the 1983 World Final or colour pictures of the bike Egon Muller rode that day - Can You Help? Robert (Bobby?) Duncan is trying to find a video of the 1987 UK Under 21 Final from Stoke. He'd also like videos showing Stoke home or away in 1987 or 1988 - Can You Help? Bryan Ward needs someone to make him exhaust pipes for an 80cc bike - Can You Help? Tony McDonald's biography of the late Kenny Carter goes on sale on 30th June. It will retail for £15.99 (p&p is free). Contact Retro Speedway on 01708 734 502 to pre-order your copy. "If Sky's coverage bugs you that much then don't watch! Without Sky speedway would be at its death bed by now. Perhaps if those that run the sport could put better quality teams together, thus producing closer racing, then the commentators would be the last thing on our mind!!" "I always look foward to 'A GREAT NIGHT OF SPEEDWAY' when I tune in to Sky on Mondays. BRING ON THE CLICHES!!!! I LOVE EM !!! Love the blog, right on the money." "How I wish I could turn on my television here in the U.S. and see Belle Vue vs. Wolverhampton, or even the local speedway sideshow at Costa Mesa. If Mr. Scott were to move to California, he might be shocked to discover there is no speedway on tv here. None. Ever. Not even the slightest mention of the Grand Prix on the sports news. To see this year's Grand Prix, I'll have to wait until the DVD set is produced, months after the series is over. I'll have to send away for a copy from the U.K. It will be in PAL format, so I'll have to watch it on the special DVD player I had to purchase from the U.K. that converts PAL-format DVDs into the NTSC format used by U.S. televisions. But it must be a terrible hardship to have to listen to Kelvin's and Jonathan's babbling every week when you flip your tv on to watch speedway! " "Having read Jeff Scott's article about the Sky coverage of the Wolverhampton-Belle Vue encounter earlier this season I am pleased to see that he echoes many of my own private thoughts about the TV coverage. GP's apart, I rarely watch the coverage live, preferring to record it on my newly aquired Sky plus equipment. This is not because the wife will not relinquish the controls to allow me to view live (although she was the one that insisted on the purchase of the 'plus' bit when she realised how many live meetings this season were to be covered - World Cup included), no it is simply because of the idiotic banal comments trotted out on an all too frequent basis by those presenters, commentators and interviewers employed for the purpose. Floppy Norris and Havvy, Chris Louis and occasionally Steve Johnston excluded, the others simply have me reaching for the controls to turn the sound down. Tony Millard is better off phoning in reports to the Soccer special programme on Sky saturday afternoons simply because it only lasts a minute or two and then you can relax! "Line abreast"....when clearly at least one of the riders is at least two bike lengths in front. "With a vengance" is another hackneyed phrase trotted out time and again. I thought Sarra Elgan did a good job and must say that she seems far more relaxed and informed than any of the other female interviewers used by Sky. The GP's fare no better and the studio discussions that take place with Keith Huwen often have me reaching for the volume control. Can someone explain why being a 'Superbike' specialist qualifies him as anchor man for speedway meetings? 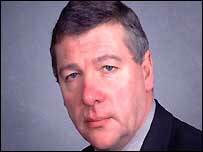 Bring back Dave Lanning or better still find a true speedway enthusiast who is new to TV work. Now that would be a novel approach! Thank you Jeff. For making me realise I am not just a grumpy old git!" "I often wonder why they pick some of the matches shown, last season was proof. I do believe Poole v Lakeside is to be shown live? No disrepect to Lakeside, but it's not a match I would take someone to for the first time. I have e-mailed Sky about the choice of meetings but never had any reply, but please don't knock Sky's coverage, I for one would not like to lose what we have." We enjoyed this article from Jeff Scott's blog so much that we asked permission to reproduce it here. Jeff seldom pulls his punches and he lands quite a few blows with this analysis of a recent Sky TV meeting. You'll never see Jonathan and Kelvin through quite the same eyes again after reading this. Aussie Andy Davidson snapped these pictures of this Polish circuit on one of his trips to Europe. Gregor selects his Leicester Lions influenced dream team and shares some rather strange childhood memories in the process. Does anyone else remember Colin Cook's belt or Wibble Purple? The much-anticipated biography of Kenny Carter goes on sale on 30th June. It will retail for £15.99 (p&p is free). Contact Retro Speedway on 01708 734 502 to pre-order your copy. Paul Wilkinson is trying to get back in touch with former rider Pete Ellams - Can You Help? Jock Davidson's long established Devon Shirts company are now selling their wares online. They're the sole supplier of Jason Crump merchandise and that can also be purchased through the website. "I remember Kelvin Mullarkey's last match for Rye House. His fall was typical Mullarkey, looking around trying to get the referee to exclude someone else despite the fact it was his fault!!! He was one of those riders opposition fans loved to hate and I suspect he knew it. The sport doesn't have characters like him any more!!!" "This looks like being an important addition to any speedway library. I was especially intrigued to see the name Roy Uden as racing at Rye House in the war years. I thought that Roy only started on speedway in 1948 when he rode for Rayleigh, although he was a well known performer on grass tracks for many years. And post-1954, Roy Uden drove stock cars at many tracks, including Rayleigh. In the late 1950s, I spent many Sundays watching Rye House - home and away - in the old Southern Area League, when I was especially friendly with the 'East End Trio' of Vic Ridgeon, Al Sparrey and 'Tiger Tim' Jim Chalkley. The latter, without success, tried to tutor me as a speedway novice - but I could never get above two-miles an hour when on track!!" "I went to Slany last year, whilst in the Czech Republic for the GP. A few of us ventured to the track for an under 21 Test Match. For £1.75 including a programme, I couldn't believe it. The racing was one sided, but the experience was worth the visit. Terrific stadium, I wonder how it looks when the "big boys" race there!" "Thanks loads for the memories! Sadly I am old enough to remember the starting gate boards at Canterbury. We followed the Canterbury Crusaders all over the country, which improved our knowledge of the geography of the UK no end! Great days much missed now. Wish I had kept my huge colletcion of speedway items - never mind. One of the things I hung on to was set of miniature metal bikes and riders; the riders I hand painted in Canterbury colours, or course, and even had a go at reproducing their leathers; Barney Kennet, Ted Hubbard, Brendon Shiletto, Keith Pritchard, Denzil Kent, Kevin Howland, Graham Banks are all respresented, as are a few others. " "Scunny looks a nice and tidy place already. Few more 'permanent' facilities and it could be a great little place. Nice one."